Product #16873 | SKU BA1715500VA-6106-BP4 | 0.0 (no ratings yet) Thanks for your rating! Varta Professional Lithium AA batteries are 1.5V and offer great value for money. Designed for high drain equipment these Varta Lithium AA batteries last 8 times longer than Varta alkaline batteries in digital camera tests. 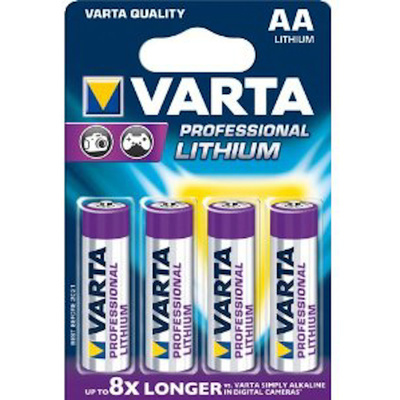 Varta Professional Lithium AA batteries are also known as L91 batteries. They are ideal for individuals, professionals or business and industrial users.